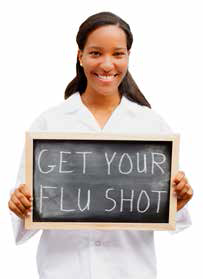 We offer flu vaccinations on a walk-in basis at all three of our Kenosha locations. Flu vaccinations are covered under most insurance plans. Flu vaccination should begin soon after the vaccine becomes available, ideally by October. However, as long as flu viruses are circulating, vaccination should continue to be offered throughout the flu season, even in January or later. While seasonal influenza outbreaks can happen as early as October, during most seasons influenza activity peaks in January or later. Since it takes about two weeks after vaccination for antibodies to develop in the body that protect against influenza virus infection, it is best that people get vaccinated early so they are protected before influenza begins spreading in their community. ■ Wash your hands often with soap and water or an alcohol-based hand rub. ■ Avoid touching your eyes, nose or mouth. ■ Try to avoid close contact with sick people. ■ Practice good health habits. Get plenty of sleep and exercise, manage your stress, drink plenty of fluids and eat healthy food. ■ Cover your nose and mouth with a tissue when you cough or sneeze. Throw the tissue in the trash after you use it. ■ If you are sick with flu-like illness, stay home for at least 24 hours after your fever is gone without the use of fever-reducing medicine.